Oh, goodness! The secrets come out. I have an aquatic turtle in my office (for my day job), and she’s in a 75-gallon tank, which is pretty big. I tell people her name is Juanita, because it is, but that’s her second name: her first name is Jia-you, which is Chinese and means “keep on going”. When I first got Juanita, I was really excited to learn that she loved eating crickets, and I found this company on eBay that sold live crickets. I ended up buying 3,000 live crickets (combined shipping! Batches of 1,000!) and had them delivered to my office. I don’t think you’ve really lived until you’ve had 3,000 crickets in three ventilated boxes, sitting in your office, smelling all cricket-y. My boss had no clue what was going on and many times walked in and out of my office without even noticing the crickets, which was a minor miracle and good news for us all. Of course, then I had to figure out what to do with 3,000 live crickets, but that’s another story. I don’t really have a nickname right now. Growing up, I was always very clear that my name was “Crystal”, not “Chris” or “Chrissie” or “Christy”. My brother, being the unique person he is, decided to call me “Bale”, and that lasted for many, many years – but he was the only person who could call me that. With writing? That I won’t be true to my characters’ inner emotions. I take what’s in my heart and turn it inside-out. Focused, curious, passionate, listening, chocolate-loving. In my novel Bird, I would probably be Grandpa. I love his character arc, where he goes from granite-silent at the beginning to singing at the end of the book. That takes a lot of courage and a lot of openness to new ways of being. And I think that’s pretty great. I would go back about fifty years and meet my (maternal) grandmother. She died just a couple years ago, but she contracted Alzheimer’s disease when I was nine or ten years old, and I mostly just knew her through her disease. Most of my life she didn’t know my name. Her children, my aunts and uncles, would tell me stories of how resilient and strong of a person she used to be, how daring and kind of in-your-face, but I never knew that side of her. I’d love to get the chance to know her before the disease set in. Wow. I had no idea that your dreams could be so powerful. I’ve been fortunate to have a lot of mentors growing up. One of them was my drama coach in high school. He not only helped me get out of my shell, but he helped me see that at heart, I am an artist. Even more than that, he was always around, always available to listen, and he taught me of the incredible power of listening by doing just that, by listening. He was amazing. I’ve always been writing. I got a journal when I was in kindergarten (a Cabbage Patch journal!) and have been writing ever since. I have boxes of journals. There’s just such a release in writing, be it on paper or on the screen. It’s like: Yes. That’s what I’m thinking, that’s what I’m feeling. Primal. I use it all the time. I think there are a lot of things that are primal to us – our emotions, our responses, our desires – and these deeply rooted things are both mysterious and powerful beyond measure. That’s a hard one. I’d probably say The Interior Castle, by Theresa of Avila. I mean, yeah, she wrote this book and died hundreds of years ago and was a Catholic nun and all, but she had some great imagery for what goes on in the depths of the spirit. And furthermore, in an age when women were not too much more than cattle to be bought and sold, she was traveling around her world at the time, advising all these political leaders, and religious communities popped up wherever she went. She’s like a contemporary community organizer inspiring an international movement, almost single-handedly. That’s just cool. 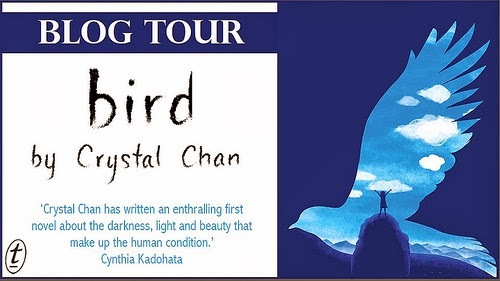 This post is part of the blog tour for Crystal Chan's debut novel, Bird, published by Text Publishing and available at all good bookstores for RRP $16.99. Make sure you visit the other blogs on the tour and visit Crystal Chan''s website to find out more about Crystal and Bird. Thursday 30 Jan - Review by Kate at whY.A.not?